Treat on the Go! is a fine grain Himalayan salt product containing a 25 day supply of our mineral rich salt. 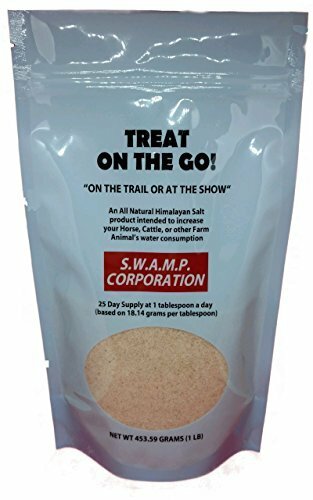 This product is ideal during animal transportation, horse shows, trail rides, livestock tradeshows, and for everyday use. Treat on the Go! offers the same mineral content as our Salt on a Rope and is also free of additives, preservatives, iodine, and other harmful chemicals. With Treat on the Go!, you can limit the amount of salt being consumed per day by your animal, helping to ensure proper hydration. Every animal, and person for that matter, needs an adequate amount of salt daily to ensure proper physiological activity. The trace minerals in Himalayan salt provide numerous mineral benefits that a traditional pressed salt lick and other mined salts cannot. S.W.A.M.P. Corporation only imports the highest quality Himalayan salt available for animals. Our Treat on the Go is a natural, cost effective, and consumer friendly product that contributes to an animal's overall health. Himalayan salt is a natural salt, rich in minerals, which is free of: preservatives, additives, chemicals, and iodine. Himalayan salt contains 84 trace minerals, making it the most mineral-rich salt available for consumption. Vital minerals to an animal's overall well-being such as Calcium, Magnesium, and Potassium are present. We at S.W.A.M.P. Corporation are proud to supply the highest quality natural salt available and appreciate you considering our products. Net Weight of all Treat on the Go packages is 1 lb. This product has not been submitted or approved by the FDA for human consumption. This product should only be used for animal consumption as intended. 84 Trace Minerals. All Natural, No Preservatives or Additives. If you have any questions about this product by S.W.A.M.P. Corporation, contact us by completing and submitting the form below. If you are looking for a specif part number, please include it with your message.